Sharing with you a card I made with the stamp set that I had won at SU! 's OnStage last November. The Highland Heather base of the card allows the Granny Apple Green leaves just pop! 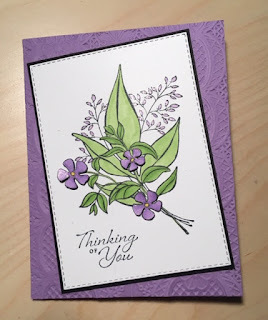 I simply love working with the Stampin' Blends. Coloring flows and they don't leave lines; giving a professional look to the finished piece. The coordinating framelits have sold out, so I chose not to use them. Instead, I did some fussy cutting on the flowers and popped them up with mini stampin' dimensionals. Though hard to see, I added a little Wink of Stella to give some shimmer. An elegant card that's now ready to send to a friend.